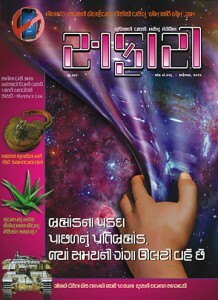 There are thousands of magazines published every month in all remarkable languages. There are a few though which actually adds to your knowledge and brings factual information. 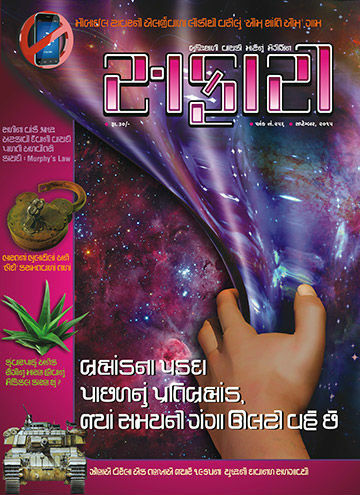 Safari – a knowledge magazine from India – is one such magazine. Though, it’s English edition couldn’t survive more (bad luck of quality readers), its Gujarati edition is now around 35 years (with some breaks) older and popular as well. The September 2015 issue of Safari is out on time and here are our views for the same. One of the most important article found in this issue is about “Why time travels in a specific (forward or backward) direction?“. The article talks about the balance of entities found in the universe. As there are positives, there are negatives available to balance it to the neutral. Even talks about anti-matter is well-known to the avid readers who read science and knowledge books and magazines. The article brings some important points and explores the possibilities about the existence of the universe where time travels in possibly revert direction then ours. The article also brings some logical examples that while traveling in reverse, some stuffs cannot be done (Eg. re-construction of broken things). The article is worth reading for sure. If something can go wrong, it will. What do you remember when you read this sentence? Of course Murphy’s law, right? However, Murphy didn’t utter the same words, but the summary of what he wanted to convey was something like that. And, hence, the theory is popular as Murphy’s law. The famous and popular example of the same is, when you are on the dining table, having a bread slice with cheese (or butter) spread over one side of the same, if fall from the table, the side with the cheese will touch the ground (and hence make it dirty and non-eatable). As found in this case, when the loss is possible, it will be the biggest one. The same article published many times in previous issues of Safari. It however this time starts with the historical example of a war scene where a soldier, due to his generosity, spared life a German soldier, who was at his mercy. The German soldier who survived considered as the reason of a number lives lost. The saved soldier was none other than – Adolf Hitler! If his life was not spared on that day, the fate of the World might have been surely different. The article is written in nice manner, and added with so many such examples. Reading such articles will not only amuse you, but definitely improves your knowledge about the history as well. Definitely worth reading. The nature always have an answer for all our needs. Our health functions are not an exception. We can recover from majority of illnesses using various plants, its seeds and leaves etc. However proper knowledge of the same is required of course. And fruits are considered as one of the best source of pure energy. Aloe Vera is considered as one of the most genuine remedy. Aloe is a set of around 400 species under its hood. Aloe Vera is however the most prominent (in health context) name from the same. An in depth article about the same is definitely worth reading. In the time of Allopathy; homeopathy or Ayurveda medicines are always considered secondary. However we must remember that the animals and birds living in the jungle uses such natural stuffs to recover from whatever illness they are caught with. Talk about Kashmir and you remember the words “heaven on the Earth“. But, at the same time you also remember the border issues in India and Pakistan which are the central cause of all the Indo-Pak wars. No doubt the Kashmir is not anymore the same as it was, but then also it is definitely a beautiful space with humble people living there. It is often found that the seeds of the war fought today are planted before so many years (and sometimes, even before decades). In order to understand the facts, one need to study the history properly. An article written by Nagendra Vijay on the issue of Kashmir, and how it is played a part in the game of political dice by so many Pakistani rulers, explores so many facts which are eye opener. The article is written nicely and it analyse so many historical incidents logically. The article is mainly focused on how a statement of Jinnah in 1947 played vital role in the 1965 Indo-Pak war; but the article have much more of it. Definitely an article worth reading. D. N. Kaushik’s article about “locks” explores some facts about various extra-ordinary locks. Aligarh (or Aligarh) is famous for locks. It was a hub of lock manufacturing business in India. There was a time when Aligarh and lock were synonyms of each others. The article is written nicely and contains references to Aligarh as well. This General knowledge category article is a good read. Every coin has two sides and thus a lot new inventions come with its side effects as well. We know that the cell phones gives us mobility and better known as mobile phones. They are of course a technical marvel and have significant benefits without a doubt. The micro waves used by cell phones and their towers have their own adverse effects on the health of people. The effects are often negligible for most of the people and are not much talked about under the heavy influence of the lobby of telecom operators (and usability of mobile devices). Though we often hear the cases where we found people getting migraine (and other similar problems) when living in the neighbourhood of mobile towers (or excessively use mobile phone). There are people who are more fragile to the effects of electro magnetic radiation however. A place named Green Bank famous for being a silence zone for such radio signals. Hence many people who suffer from electromagnetic hypersensitivity loves to move to this small town to live happily. A small article about electromagnetic hypersensitivity and cases of people suffering from the same is a notable read. Which is the lightest solid component? There was a detailed (4500 words) article published on WikiPedia about a fictional war in India (which obviously never fought), which was that? There are so many Hindi Films made (and being made) about legend patriots of India who sacrificed their lives for the freedom; how realistic are they? Are we prone to the Supernova blast of any significant star in near future? The polar bears of north pole are facing survival problems due to green house effects, can they be ported to the south pole? How come the railway lines manage to absorb the tension and pressure of such a heavy trains? Are microwave ovens prone to leakage? How dangerous are they? Which was the first election held in Independent India? What is the ideal time the human body parts can be used for the transplant (after the death of the person to who they belongs to)? Why the importance of Bicycle and its usage, is remarkably increased in some countries?